The reason it says "MM" is because my Mum had me at 18 so she has never felt old enough to be referred to as "Gran" or Grandma. She invented MM and it means "Mum's Mum" - when I was pregnant I thought my baby will never be able to say MM, but like with many things, I was proved wrong and he has said it for a VERY long time and it rolls of his tongue very easily. So this book is a dedication to my Aaron's MM, that will provide cherished memories, live on the page, via her Christmas present. Hopefully as it is LARGE it will be like a beautiful coffee table book for her to cherish and I know she really really will. What with us living in the UK, and her in Ireland, it is nice for her to have photos close to hand, that are not lazing around on my computer. She has neither computer, nor internet, so her sharing images of Aaron via the likes of Facebook is not a possibility. I am glad I got cracking and ordered it as it will take a fortnight to come, and that means I have time to enjoy it before I send it to her. Doing something like this is not something you can leave until Christmas Eve, and until I had a baby THAT was when I did ALL of my gift shopping. Even last year, due to a (sad) wave of redundancies at work, I bought Aaron's Christmas presents on 23rd December. It is obviously not the done thing as Toys R Us was dead! I felt gutted. I will not be letting that happen this year. I opted for the large landscape book, and I think she will love it as it covers all of her UK and Ireland memories with Aaron, and as I have never printed all of these photos, I'd say she's never seen the majority of them. So lovely to bring photos to life and get them OUT of the computer hard-drive. Also means she can share them with others. I know what my Mum is like, she will spend hours looking through it and no doubt see something different/extra every time she does. I was approached by Blurb to be an affiliate, and I must say I am enjoying it so far. The beauty of doing a book with them is that you download "BookSmart" and basically get to create the book locally, offline. It means if you want to upload photos it is incredibly quick as you are doing it locally. 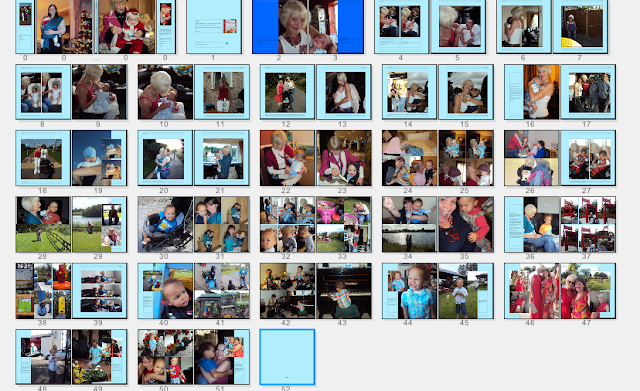 So I uploaded my book in batches: 2010 photos, Summer, then Christmas, then Summer 2011 and so on. If the book was being hosted online, this would have been far too time consuming. It meant that designing the book was a real pleasure. I went through phases where I was doing page selection and photo choices. Other phases where I was concentrating on text inserts, and still more phases where I was substituting single photo pages for multi. I got carried away and ended up with a 52 page book but I think my Mum is worth it. When you order your book, you can get an ebook free and you can pay to order a PDF. I ordered a PDF of the above and I am already enjoying flicking through it again and again and can't wait till I have the real thing in my hands. I have made many a photo book in my time so I feel qualified to say that my experience with Blurb was great - I spent every spare hour I had at the weekend making my book and it really got my creative juices going - like I said above it is so quick as you are creating it offline on the BookSmart software that you download. It does mean when you are ready to order the book, you need AT LEAST 30 minutes to spare to upload it. I guess I will only be able to completely review the process when I can comment on the quality of the book, which I will have in just over 10 days (as I opted for the cheaper delivery timescale option). Blurb is a creative publishing platform that unleashes the creative genius inside everyone. Blurb's platform makes it easy to design, publish, market and sell professional-quality books. Blurb's bookstore and online marketing tools enable customers to market and sell their books, and keep 100% of the profit. Blurb's social and community features allow customers to create and share Blurb books among friends and colleagues with ease. More than photo books. In addition to photo books, our product range extends to notebooks, cookbooks, weekly diaries, novels, Facebook photo books, Instagram books and more. Books start from just £1.75. 500+ ways to customise your book. Personalise your book with a huge range of paper types, cover options, endsheets, templates and books that go up to 440 pages (that's 300 more pages than the other guys). Free Design tools – no matter what your skill set. Select your design tool - Blurb Bookify™ for easy online bookmaking, Blurb's award-winning BookSmart® programme or Blurb's PDF to Book workflow for the pros. ebooks. For just £1.49 you can also create an ebook. Share your book. Share your book using the Blurb BookShow™ widget, a book preview that can be shared on Facebook, Twitter, blogs and websites. Sell your book. Sell your printed books and ebooks in Blurb's online bookstore keeping 100% of the profit. Books are delivered 7-10 business days from date of order to your door. Excellent customer service 24 hours a day, 7 days a week, available in 7 languages. This is a great review, thank you. I have a few books in draft in both blurb and kindle. I'm doing finishing touches at the moment, and you are quite right, it is very creative. Well done on your lovely book x. Can't wait to see what the quality is like when it gets delivered. Still struggling to create mine. I love the idea of it though!